The season for a rider on Tinkoff-Saxo is extensive. With races starting in January and finishing in late October, riders are always trying to balance and optimize their fitness throughout the year. Shape is everything, but it’s impossible to maintain top level during the entire season, not to mention the off-season. 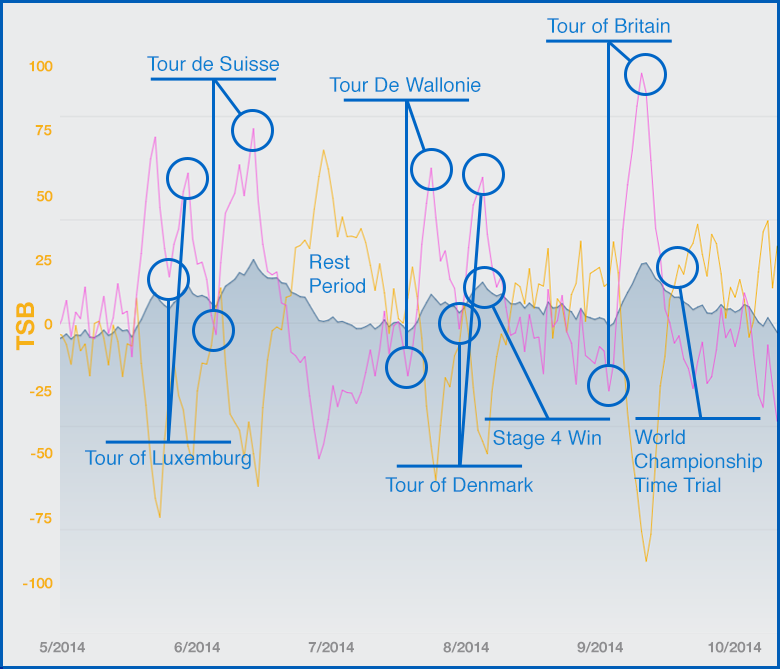 So how does Tinkoff-Saxo manage fitness and fatigue together with TrainingPeaks? Combining rider data from power meters with a powerful tool such as the Performance Management Chart allows us to manage and plan the shape of each individual rider to make sure that they peak at the right time. TrainingPeaks is equally a tool for the ambitious amateur riders looking to optimize their shape during the year and before important events. “Primarily, TrainingPeaks is a great way to plan my season and all the small details to gain the last percentages. Secondly, it gives me confidence and self-assurance in that I’m training the right way – that means one less thing to worry about. The sensations from my legs and shape are confirmed by the numbers in the graphs, but it doesn’t mean that I have to train less hard,” says Manuele Boaro with a smile. He is currently training with the rest of Tinkoff-Saxo on the team’s camp on Gran Canaria. So how do the pros use the Performance Management Chart? Starting with his first race, the Tour of Qatar, in February and ending with Japan Cup in October, Boaro had a total of 75 days of racing. Manuele, his coach and the sport directors have worked closely to continuously increase or decrease the amount of training. 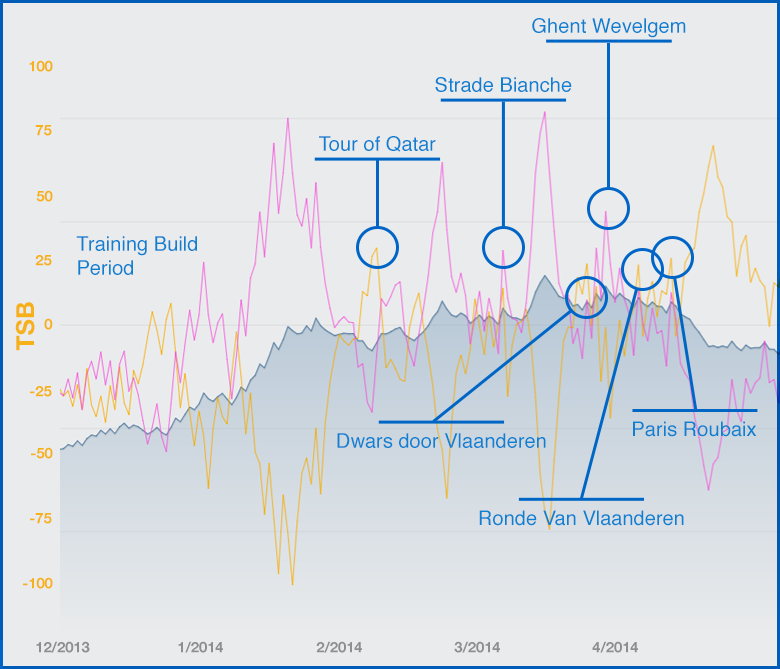 Using the Performance Management Chart (PMC) in TrainingPeaks, we can see how Boaro peaks three times during 2014. Every ride, training or race, is given a Training Stress Score® (TSS®) based on the duration and intensity of the effort. Using daily TSS, the Performance Management Chart calculates the Acute Training Load (ATL) seen as the pink line in the graph – this describes Boaro’s short-term fatigue. The blue line on the other hand shows fitness, or Chronic Training Load (CTL). As Boaro races or trains he gains fitness, the blue line, but also accumulates fatigue, the pink line. In addition to the ATL and CTL, the Training Stress Balance (TSB), seen in yellow, indicates the rider’s balance between fatigue and freshness. A TSB in the positive indicates freshness while a negative number indicates fatigue. There’s a direct relationship between these three elements. A rider may have a high level of fitness, but if his short-term fatigue is equally high, he is likely too tired to take full advantage of his current shape. On the other hand, if a rider rests too much he will lose fitness. The optimum result is reached with as high a CTL as possible and a TSB of around 20. Over a long season with many races, there are only a few periods where a rider can achieve this perfect balance. The PMC can be used by any rider that is looking to perform their best. Managing the training load to ensure fitness without overtraining, and to be at peak fitness and freshness at the right time is the key to having a great race or event. Boaro’s season is broken into three sections: early, mid and late season racing, with a rest period after the early and mid season races. This is to allow him a longer recovery period between blocks of racing. Boaro started the season with a big block of training. In fact, he records his highest ATL and lowest TSB of the year before his first race. This carefully prepared training boosts his shape before the season. With a focus on shorter stage races, Boaro begins his early season racing in February with the Tour of Qatar and follows this up with a particularly heavy schedule in March and early April. He starts one of his favorite races, Tirreno-Adriatico, in early March with a CTL of 154. This race gives him a bump in fitness raising his CTL to 173, but also creates fatigue, pushing his TSB to an extremely low negative 79. After 8 days of active recovery, he is now rested shown by his TSB rising. So now he’s fresh and still has more fitness than when he started Tirreno-Adriatico. Boaro then maintains his fitness while riding the northern classics such as Dwars door Vlaanderen, E3 Harelbeke, Gent-Wevelgem. He then takes a week of rest to gain freshness before racing two of the hardest one-day races on the calendar, Ronde van Vlaanderen and Paris Roubaix. This period constitutes his first peak of the year. After Roubaix, he takes a well-deserved rest for a month, allowing his accumulated fatigue to lower and his TSB to rise to an all-season high. A break like this is critical for any cyclist to be able to race well over a long season. Every rider has a different point at which they feel fatigued and need a rest. We see Boaro hit a low TSB of negative 79, but most amateur riders would need a rest around negative 30. Using the PMC, you can learn when you need to rest and can do so before you are injured, sick or overtrained. After resting, Boaro again starts racing heavily. This is his second peak period of the year. Over this period of racing we see that the consecutive days of racing bring his CTL up to its highest point all season, 180, indicating very high fitness during Tour de Suisse. However, with little rest between the stage races of May and June, his TSB drops to extreme negatives (-75, -54 and -63), which indicates that he is now very fatigued. Once again, Boaro takes a break to allow for full recovery and his TSB improves. After a recovery period in July, he races Tour de Wallonie to bring his racing legs back and reach his third peak of the year. At the Tour of Denmark he is fit from the season of racing and relatively fresh due to his recent rest. This allowed him to have his best performance of the year winning the Queen stage of the Tour of Denmark in breakaway fashion. He goes into the 7 day Tour of Britain in September with a relatively high TSB. But with less racing, his ATL and CTL are lower than at previous points of the season. So while he’s fresh, he isn’t in top shape. He then rests and makes a swift recovery – the hallmark of a professional rider. He lightens his efforts in late September and October and finishes his season at the Japan Cup, where he starts focusing on making a full-scale recovery before building up his fitness ahead of 2015. Using the Performance Management Chart allows the coaches and riders on Tinkoff-Saxo to monitor fatigue and fitness levels to maximize results. This powerful chart is not just for the professionals. Any cyclist that wants to reach their full potential can use it to reach their goals.